2 Week Trial Membership - Up to 12 Classes! Our martial arts programs are designed to empower people with CONFIDENCE as they go through the school year building new relationships, making important decisions, and forming healthy habits. Kids discover their might on the mats and find new ways to challenge their mental and physical selves! Watch your child THRIVE with a program that builds STRENGTH, SELF-ESTEEM, and DISCIPLINE. You’ll feel the benefits in your home with better sleep, more focus, and happier moods. *These Special Offers may not be combined with any other offer, discount, promo, or gift card. Students new to the studio only! Ages 4 and up, must be able to perform in a group setting. Hurry, these offers end soon. Download our app & enable push notifications to notified of events and special offers! Getting started is easy! All you have to do is download our app in the APPLE APP STORE or the GOOGLE PLAY STORE & enter the studio code 5617905422 to access our special offers, events, curriculum, and more! 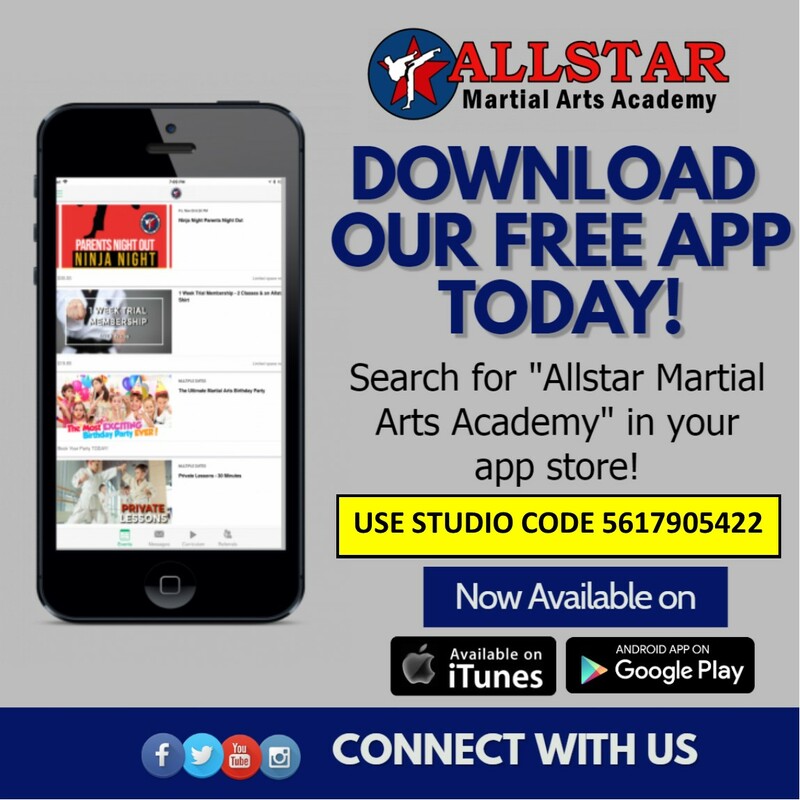 At Allstar Martial Arts Academy, students age four and up learn and have fun in a safe, clean, and motivating environment. We offer an experienced and professional staff that will guide you or your child to success using our proven training methods. Children's classes provide discipline, structure, and great exercise through age appropriate self-defense training, traditional martial arts skills training, and success training. Students build confidence and strength as they progress through the different skill levels and begin to focus on the ultimate goal of becoming a Black Belt. Contact us now to start training. Allstar Martial Arts is an amazing experience for the whole family. I practice tae-kwon-do there and so do my two daughters. We have attended this academy for 7 years now and have loved it the entire time. They teach focus, discipline, and how to be respectful. We have made a lot of great friends there and are now one big happy family! Allstar Martial Arts Academy is a very welcoming dojang. They provide children with a hard working, fun and disciplined environment. My son has learned so much the past year he has been attending Allstar Martial Arts. He has more patience, focus and most importantly learning self defense and discipline. The Lord family is very caring and patient towards the children and they ensure that every child is on the correct path to success. I look forward to watching my son grow at this dojang! Thank you Lord family for all that you do! Allstar Martial Arts has felt like a second home since the moment we started. Being family owned and operated, the Lord's have made us feel very comfortable there. My daughter (4) is held to appropriate standards, guided (usually one-on-one) when needing help with anything, and feels comfortable there as well. She has excelled with her focus and discipline in just a few short months. I highly recommend allstar martial arts for your Tae Kwan do needs! ALLSTAR MARTIAL ARTS provides excellent quality instructions. I highly recommend to everyone! My son has attended this great academy for almost 8 years. He is a 2nd Degree Black Belt, and he has achieved significant results in leadership development, self-defense, self-esteem, discipline, and confidence. I will always be thankful for Allstar Martial Arts!!! (561) 790-5422 . You can also fill out the form located at the top right side of this page. Try it today!